studyON HSC Business Studies Teacher Edition enables you to view student performance on practice questions and exam questions taken in studyON HSC Business Studies Student Edition. Once connected to your students, you can set up classes and groups, and monitor and report on individual students' progress. 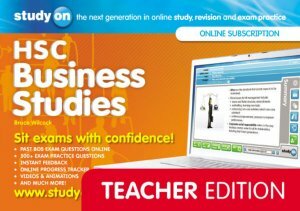 studyON HSC Business Studies Teacher Edition includes studyON HSC Business Studies Student Edition so that you access all the HSC Business Studies concept screens, videos, interactivities, past exam questions and more. With studyON Teacher Edition you can monitor the progress of your students throughout the year and pinpoint areas that require further revision in the lead up to exams. Your students will automatically appear in the 'unassigned students' list on the setup page of your teacher edition once they have ‘connected' to you in their studyON student edition. To view collective results you can create as many groups as you like, with students in multiple groups. The ‘Monitor' feature allows you to view the studyON activity of each student for any period in the calendar year while the 'Report' section enables you to view student performance and results in a variety of ways. Reports created in studyON Teacher Edition can be exported and downloaded in Excel format. Jacaranda's digital products are available via onlinepurchase. Following payment you will receive an email with your studyON Teacher Edition registration code. Go to www.jacplus.com.au to register your code and access studyON.